This GE 30 inch White on White Free Standing Electric Standard Clean Range, features a large 5.0 cu. ft. oven capacity that provides an impressively large interior for cooking more dishes and large meals at one time. This model features a glass-ceramic cooktop, made with a specially engineered ceramic glass that has an amazing resistance to both stains and impact. The range features Dual Element Bake, which alternates the upper broiling element and the lower baking element for even heating and optimal baking results. Café Wall Ovens offer a true built-in appearance because the ovens are installed into surrounding cabinetry which provides a custom look. It features GE's TrueTemp system -inchmanages-inch oven temperatures to ensure accurate, consistent heating and total cooking performance. The Hidden Bake Oven Interior hides previously exposed bottom element to deliver a clean interior appearance. Plus, a third heating element surrounds the fan and delivers consistent heat for True European convection. Prepare a meal for family or friends with this 30-inch Café gas double oven. Six burners produce up to 21,000 BTUs to quickly cook foods, and its integrated griddle lets you make pancakes and French toast without a pan. This 6.7 cu. ft. Café gas double oven has Wi-Fi capabilities, so you can control oven functions from your smartphone. 30-inch 5.0 cu. ft. 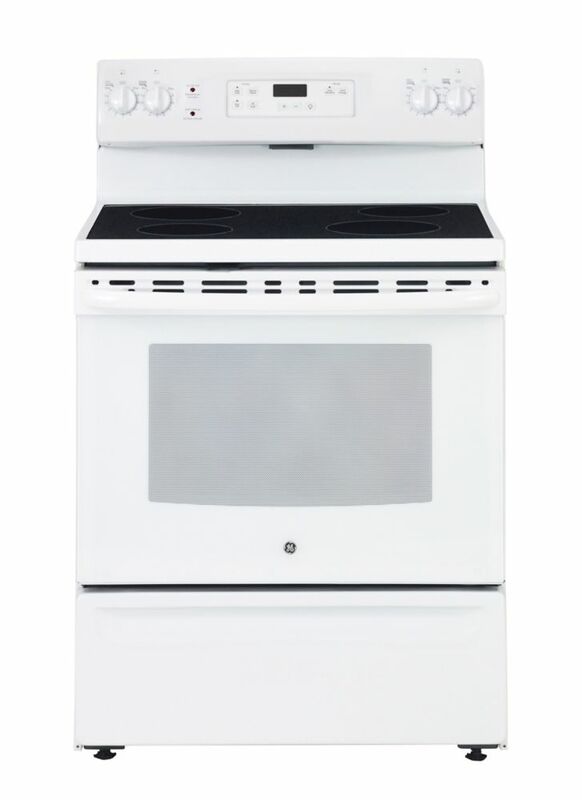 Single Oven Electric Range Oven in White This GE 30 inch White on White Free Standing Electric Standard Clean Range, features a large 5.0 cu. ft. oven capacity that provides an impressively large interior for cooking more dishes and large meals at one time. This model features a glass-ceramic cooktop, made with a specially engineered ceramic glass that has an amazing resistance to both stains and impact. The range features Dual Element Bake, which alternates the upper broiling element and the lower baking element for even heating and optimal baking results. 30-inch 5.0 cu. ft. Single Oven Electric Range Oven in White is rated 2.5 out of 5 by 2. Rated 3 out of 5 by Stellers Jay from Nice looking range I really like the way this range looks in my kitchen and how easy it is to clean the smooth top. I love the feature that allows you to adjust the thermostat inside the oven because this oven runs cool. Even with the maximum adjustment I have to set the oven at 365 degrees for my oven thermometer to read an actual 350 degrees. Rated 2 out of 5 by Shali from Baught month ago Product is alright. Hv had high end products in the past. Does this stove come with a conversion kit to propane? No, this is an electric range not gas. Only gas ranges come with the conversion kit. Why does this have an Energy Star logo but the description chart says 'No'?